Welcome to our Ischia blog, Good Morning Ischia! Here you can see the entry for Sunday 1st December 2013. So in to December we go and the countdown for Christmas begins in earnest. We'll be keeping a close eye on all of the festivities over the next month or so and making sure you're up to date with the various events that happen across the island. There's lots going on, including an ice-rink in Ischia Porto believe it or not! I'll be back with more on that over the next few days and I'll try and get some nice photos for you as well. Regular readers of this column may have noticed I've avoided talking about the weather which is normally the the first thing I mention, well there's a reason for this, the weather today is awful! 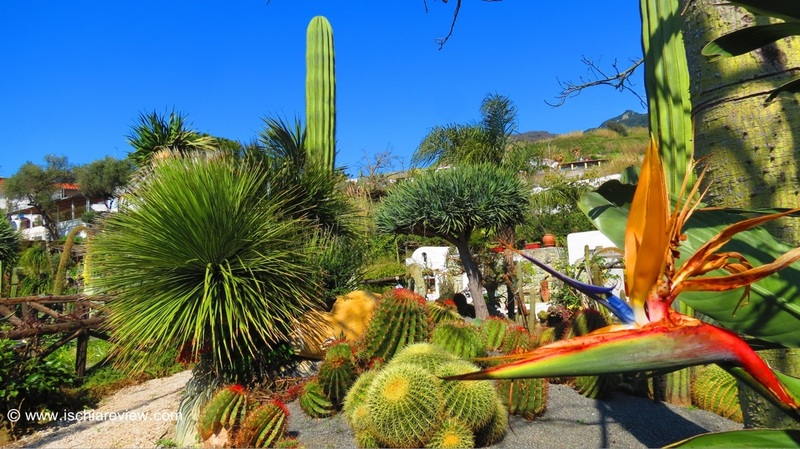 Today's photo is from the wonderful Ravino Gardens in Forio, a botanical garden that is the product of more than 40 year's dedicated work from one Captain Giuseppe D'Ambra and his family whose combined efforts help to create a magnificent palette of bright colours, fascinating plant life and some rather unexpected guests from the animal kingdom. As a young sailor, Captain D'Ambra travelled the world and from those travels he discovered a passion for nature that he subsequently put into practice when he started his modest garden back on the island of his birth, Ischia. As that passion turned into dedication and experience, the garden grew and grew until he decided to open it to the public so that they too could share his wonderful creations. The "Tropical Mediterranean Botanical Park" as the D'Ambra family describe it works to an ethos of "Ecological Tourism" and is heavily focused on eco-sustainability. During the warmer months of the year, Captain D'Ambra conducts guided walks around the 800 metre long gardens, explaining the origins of each specimen and how they need to be looked after. These specimens contain a unique selection of succulents and cacti, displayed outdoors at Ravino whereas they can mostly only be seen indoors in similar parks around the world. There is also the incredible "Wollemi Pine", a plant that dates back 90 million years ago to the Jurassic period and was once thought to be extinct. Although the beautiful plant-life is undoubtedly the main reason for a visit to Ravino, one can't help but be impressed by some rather surprising stars of the show who almost deserve equal billing. As you walk around the garden paths you start to hear some rather unusual animal noises that most people wouldn't recognise. Then one moment you will turn a corner and be met by the site of beautiful peacocks that roam freely around the garden, just as if they were visitors like you, admiring the wonderful nature around them. A visit to Ravino is certainly something you should put on your to-do-list when you visit Ischia and you can find more information on our Ravino page here, or by dropping us a line if you have any specific questions. Ok that's all from me today, have a great Sunday and I'll be back with more from Ischia next week.